<10kB. Updated 2019-04-19. Supports both Anki 2.0.x and 2.1.x. YOU FIXED IT!!! Thank you so much :) This is go great. I think this issue has been fixed with the latest version. Let me know if its still a problem. I have used it a lot and it is just what I needed to write maths equations quickly. 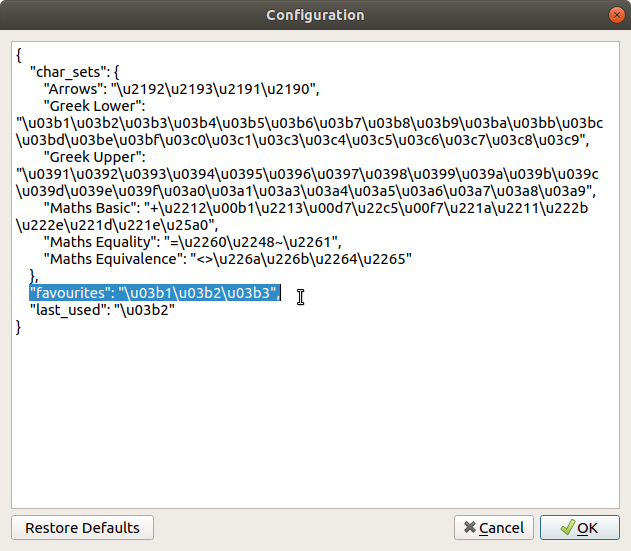 Using it from the toolbar works with 50% crash rate. However, using 'Ctrl s' seems to work everytime so that's not a problem. You're a lifesaver thanks for the symbols! The only caveat of this tool is in browse I've noticed symbols don't go to the cursor when applied and they go to the bottom of the card instead. Other than that it's awesome. Been using for a while on MacOS Mojave and very happy with it. 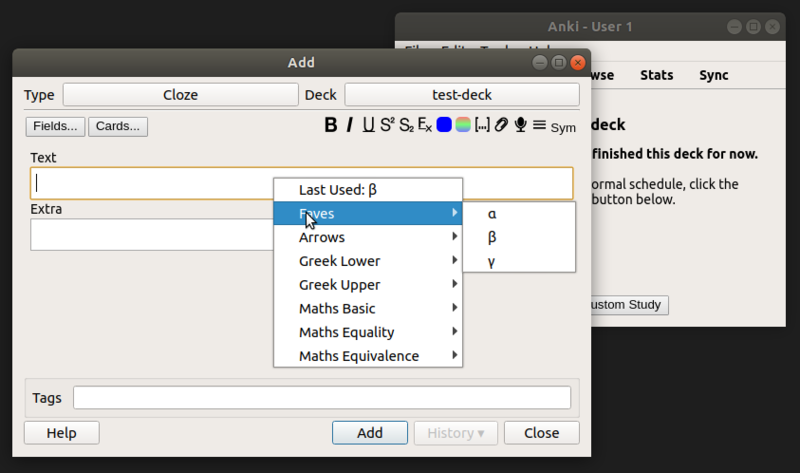 However, updated Anki to 2.1 today and it won't let me add symbols in the "Add" dialogue anymore! Still works in the "Browse" dialogue though. Please fix this! Using with v2.1.8 on Windows and works great most of the time. for example when I move from adding a symbol via the 'Add' window to the 'Browse' window and then I just have to restart anki. Yeah, there seems to be a problem moving between contexts. I'm looking into it, but haven't been able to find a solution just yet. Very useful for me, thanks! Thanks for the review, and that's no problem! The addon was basically completely rewritten for the 2.1 version and this bug was fixed for that. This keeps crashing. It only worked for me once. Symbols are not added where the text cursor is. Good add on, but could you please make it so that the symbols are inserted where the text cursor is at, and not at the end of the card after adding a line break. Hopefully you'll notice this! Could you perhaps add the 'left tack' or ⊣ sign to your add on, as it's a useful symbol for 'inhibition' in medicine. Hi! Glad you like the addon. So this issue is fixed in the Anki 2.1 version of the addon, which is where I'm focusing most of my efforts. Backporting some of the new changes to anki 2.0 is on a todo list, but a little low down in priority. But really useful when it works the other half. An error occurred. Please start Anki while holding down the shift key, which will temporarily disable the add-ons you have installed. If the issue only occurs when add-ons are enabled, please use the Tools>Add-ons menu item to disable some add-ons and restart Anki, repeating until you discover the add-on that is causing the problem. When you've discovered the add-on that is causing the problem, please report the issue on the add-ons section of our support site. Installed the addon and it didn't work at all. When trying to add the arrow symbol, an error message would pop up saying that I have to close anki and disable the addon. It was great when it worked for 1 day but I can't get it to work anymore! A window keeps popping up saying that there's an error to this add on. Can you please fix it? Incredible! It's so easy to add your own symbols. I make a lot of cards for keyboard shortcuts so this really speeds things up for symbols like ⇧. Works now after it was rewritten for 2.1! Love it. After Install on Anki 2.1, has error when loading anki. That's what I get for skimming the docs! Rewritten for 2.1, as well as added some new features, should work now! Late reply but... Thanks! I'm a med student too, there are loads of us here! Just added some maths operators.